In a world first, almost incredibly, Riaan Manser rode a bicycle right around the continent of Africa. It took him two years two months and fifteen days, he rode 36,500 Km through 34 different countries. 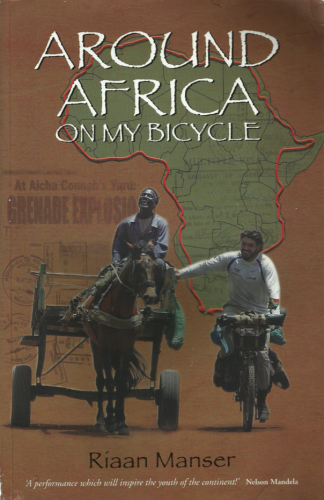 In Around Africa on my bicycle Manser tells the story of this epic journey. It is a story of blood, sweat, toil and tears. It is a story of triumph and occasional disaster. Of nights out under the stars, of searing heat and rain, of endless miles of Africa and of pressing on and never surrendering whatever the odds. Mostly however it is the story of one man’s courage and determination to escape the mundane and see the continent he loves and feels so much a part of. It is the story of the human warmth he encounters, and occasionally human wrath and hostility as he crosses troubled countries and bordres. Riaan Manser was born in 1973 Pretoria. He grew up in Zululand and attended John Ross College in Richards Bay. After studying Human Resource Management he took a job in the medical industry. He has been a lifesaver, a surfer and a rugby player. When he took to bis bicycle to ride around Africa it was a commitment to do something entirely extraordinary with his life. He is now an author and motivational speaker – and is looking for his next adventure. « The book is a mélange as varied, tasty and often frightening as the range of cuisine he experienced. It is bright, entertaining and insightful travel writing about a continent that sorely needs a good press. « Fascinating and unusual ... a wonderful optimism shone through. 2007- 705 pages – Éditeur : Jonathan Balls publishers – Johannesburg & Cape Town.